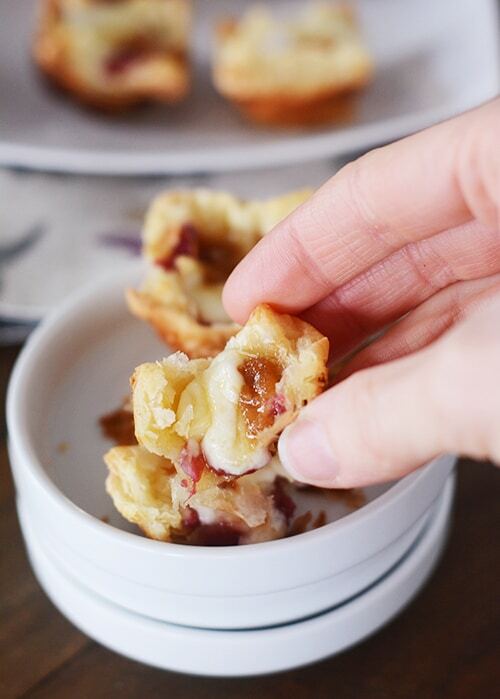 Of course, I’m not fancy or popular enough to make these divine baked Brie puff pastry bites for an occasion like that (we ate them for after school snack), but the fact that I’m kind of a boring little homebody doesn’t stop me from tinkering around with my favorite appetizer. Plus, let’s be serious, more for me, less for people that require lots of small talk. I love baked Brie with my whole soul. I actually had an entire post dedicated to the making of (step-by-steps even!) baked Brie in puff pastry. Like, the big version. 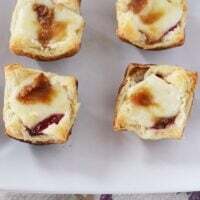 The one that’s wrapped up in a cute little package of pastry and the wheel of Brie is baked to creamy, melty perfection. Yeah, I did. And then I burned it. Really badly. As in, smoke detectors blaring and the smell of smoky, greasy, bread and cheese permeating my house and hair for days. I swore off baked Brie for at least a week. When I went to recreate it, perhaps I was still traumatized, I decided to go for a finger food route – a mini appetizer, if you will. And, all I can say is, I’m not sure I’ll ever go back. 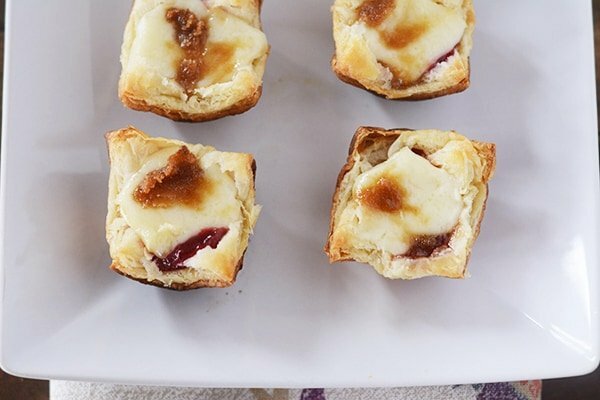 These magnificent little bites have just the right amount of pastry-to-Brie ratio and that cheese. Oh, that cheese. It’s downright decadent with the little touch of raspberry jam and sprinkle of Dijoned brown sugar. So easy to make. So very, very tasty to eat. Lightly grease a 24-cup mini muffin tin with nonstick cooking spray and set aside. Preheat the oven to 375 degrees F (for darker coated pans, consider reducing the temperature to 350 degrees). Dust the counter with a light coating of flour and gently press the sheet of puff pastry out with your hands until it is about 12X12. You aren't really thinning it out as much as getting it into an even thickness throughout and flattening just slightly. Using a knife or pizza wheel, cut the puff pastry into 25 equal pieces (five strips one way, five strips the other way). Press one square lightly into each muffin cup. You'll have one leftover square - toss or bake on it's own. Bake the puff pastry for about 8-9 minutes until lightly golden and puffed up. Remove from the oven and using the rounded, blunt edge of a spoon or spatula (or your finger), press the pastry down in the middle so it is no longer puffed up. Cut the Brie into 24 1/2-inch or so cubes. If you're working with the rounded edge of a wheel of cheese, combine two smaller pieces, if needed. Divide the raspberry jam evenly among the pastry cups - lightly warm the jam if it is too thick to drizzle in evenly. Place a piece of Brie on top of the jam. Mix together the brown sugar and Dijon and sprinkle evenly over the cheese. Return to the oven for about 4-6 minutes to let the cheese melt (watch carefully so the puff pastry doesn't burn). Serve immediately (these are divine warm but we love them at room temperature too). I made these last week, but subbed in jalapeno raspberry jelly for the regular raspberry jelly. The little bit of heat from the jam was fabulous! I, too, am having trouble with the Mediavine ads on my Windows-based computer. I can see the ingredient list, but the directions are absent. The only way I can get around this is to print the recipe. Then the directions are there. Also, when I look at your site on an iPad, the Mediavine ads are huge – and plentiful. Hi Diane – sorry you are having issues seeing the directions on the recipes. I’ll so some digging because that shouldn’t be happening. I’m sorry the ads are bothersome to you. I actually run far less ads than most bloggers in my genre and am always looking at ways to minimize the ads while still maximizing revenue to ensure all the hard work of blogging is worth it. I hope to continue streamlining and minimizing the ads in the future. Thanks for your patience. I absolutely understand and agree with you about the revenue balancing act. I appreciate your blog so much – it’s the first one I check out. I’m happy to just print the recipe so I can get the directions. Thanks for all your hard work! For some reason there’s an add blocking your ingredients list. Uh oh, that’s not good! There is usually an ad nestled in the directions but it shouldn’t be blocking the ingredient list. What browser are you using and I’ll dig into it? Mel, can these be frozen before or after last baking? I’ve never frozen them but you could certainly try – I think it should work just fine. Hi! I would like to make these for my derby party next week but since I have a little bit of time on my hands I would like to use a homemade puff pastry dough. Do you know how this will affect the cooking time? We also made these and my non Brie loving husband ate them as well. They were so yummy!! I made homemade cranberry sauce for them. I made these for NYE, and they were a huge success!!! It was the first time I had made (and possibly eaten) baked brie, and I will definitely be doing this again! I made the puff pastry part ahead of time, wrapped the pan in a plastic bag once they were cooled, and finished filling & baking them a couple hours later at the party. Yum, I think strawberry jam would be fabulous, too! Glad you loved them, Michelle! Definitely will double the recipe next time! These very really good, I highly recommend making them asap!! I made them for my birthday which is really shortly after Christmas. I offered some sweet treats, too, but figured a lot of people might be getting sick of sweet things by now, and I was right and the brie bites were perfect, delicious and gone in minutes; had to get out the second tray I had wisely made very quickly! Three people asked for the recipes and the other don’t really cook (sad, I know…) and my husband requested they appear also for normal dinner from now on and my littler girl loved them – so, with this very lenghty description I am trying to thank you, Mel, for another instant hit at my house. Merry Christmas!! Question…can you make these a few hours ahead? I actually mean up until putting the jam and cheese in? I would like to prep these to that step, then finish them off quickly. Yes, I think you could bake the puff pastry ahead of time, then assemble and heat again to melt the cheese. Oh these look amazing!!! I usually pair fig jam with my baked brie, I’ll have to give raspberry a try. Thanks Mel! I haven’t tried it but I definitely think they could be – as long as you cover the baked pastry shells (especially in a humid climate), they should be just fine. Mel, do you think they can be frozen before baking them? I haven’t tried it but I think that should work just fine! These look great and I am planning to make them for Christmas Eve! Do you remove the rind before baking? For these bites, I do, Megan, but that’s mostly because I happen to not like the texture of the rind (even though a lot of people say you don’t need to remove it). This looks like a great appetizer Mel. I’ll be making this on Christmas eve. for our family. Thanks! Merry Christmas to you and your family. A girl after my own heart! I made a Tropical-Apricot jam this year with pineapple, mango, strawberries and peaches, that I plan on using with my brie. And to make them even easier, they sell pre cut/formed bite size puff pastry! And I found some on clearance at Walmart in the freezer section! Can it get any better?! Now the trick is not eating them all myself. Bingo! I was stumped for a potluck recipe, but will make these for a Christmas party this Saturday. Thanks, Mel – perfect timing. Made them for the party and all but two disappeared within minutes, with everyone oohing. The hostess grabbed the last ones for herself. we had something similar with blackberry jalapeno jelly and a little honey inside. Very tasty as well. I think I just found my appetizer for Christmas Eve! At first I thought, going bite size was going to be a lot more work…but this is super easy and I love the idea. Baked brie is great but after a bit, it kind of gets obliterated on the plate. I like these nice tidy packages that already have the proportion worked out. Love! I’m passing this recipe on to my daughter who, like you, is a huge baked Brie fan. I’m hoping she makes this and shares the delicious results with me. Tonight I’m making your creamy white chili along with your lemon cheesecake. I always thought lemon curd was something you bought in stores until I made your lemon cheesecake! How exciting! Your honesty is such an encouragement to me. “Smoke detectors blaring” 🙂 It gives me the courage to step out of my food comfort zone and try new and different recipes. I have never worked with puff pastry before. This will be a yummy appetizer for New Year’s Eve celebration. Thank you for adding they were good at room temperature so carrying them out is an option. I (and my family) so appreciate all your hard work that enhances the atmosphere of our home with wonderful goodness. That looks so yummy! I was actually looking to make something like this for christmas eve. I was thinking for the jam part I would use jalapeno jelly (your great recipe). Just the recipe I was looking for. Thanks Mel.